Before The Joy of Cooking, there was The Boston Cooking School Cookbook. Written by Fannie Farmer, principal of the school, and published in 1896, it was the best-selling cookbook of its age – and like any classic, it is ripe for reevaluation. And who better to conduct such an examination than Chris Kimball, founder of Cook’s Illustrated and host of PBS’s America’s Test Kitchen? Fannie’s Last Supper is the result. In it, Kimball describes the experience of recreating one of Fannie Farmer’s amazing menus: a 12-course Christmas dinner that she served at the end of the century. Kimball immersed himself in the full experience of managing close to twenty different recipes – including Rissoles, Lobster a l’Americaine, Roast Goose with Potato Stuffing, and Mandarin Cake — all in an authentic Victorian home kitchen. The recipes required mastering many now-forgotten techniques, including regulating the heat on a coal cook stove and boiling a calf’s head without its turning to mush – all sans food processor or oven thermometer. Sourcing the unusual ingredients and implements led to some hilarious scenes, bizarre tastings, and an incredible armchair experience for any reader interested in food and the Victorian era. Fannie’s Last Supper is also a working cookbook, including the dishes from the dinner and revised and updated recipes from The Boston Cooking School Cookbook. It is a culinary thriller in which one travels back in time to take a fresh look at something that most of us take for granted – the American table. 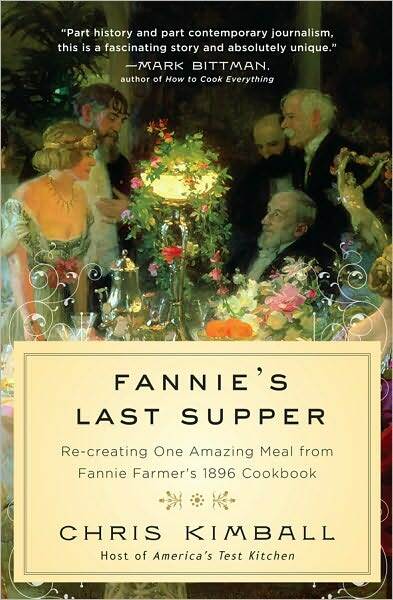 I consider myself an amateur cook, and I love both food and history (and food history) and Fannie’s Last Supper fulfills my every requirement in a book combining American social history, food, cooking, and eating habits. And better yet, a TV special accompanies the book, which will air on local U.S. public broadcast networks this Fall. Visit the official website, FanniesLastSupper.com for more information on both the book, the author, and the TV program. Evangeline, Fannie’s Last Supper got me thinking about my four great grandmothers and where they were in 1896. 1–Mary Ann T was 44, having given birth to 14 children, in the Lake District, England. 2–Mary Ann W was 38, having given birth to 4 children, in Lancashire, England. 3–Sarah was 28, with 3 of 4 children, in Missouri. 4–Flora was 17, with the first of her 13 children, in Tennessee. The one whose cooking I know most about is Flora. Don’t know that she owned the Fannie Farmer cookbook, but she became a fine Southern cook. I learned a lot about Southern cooking from her oldest daughter, my grandmother. And I learned a lot about English cooking from my English grandmother. I love exploring, and keeping alive, the family food traditions. Oh wow Jean! That is a wonderful lineage from which you spring! And the combination of good English cooking and Southern cooking must be divine.